Yesterday afternoon, Michael Cole and his Dodge Challenger SRT Hellcat ran a 9.13 quarter mile at more than 150 miles per hour, setting the new world record for a Hellcat car running without the assistance of nitrous oxide. If you pay any attention to the record-setting cars and drivers in the Hellcat world, you likely recognize the name Michael Cole. His black Mopar muscle car currently holds the world record for the quickest automatic transmission Hellcat with a time of 8.79 at 156.77 miles per hour and over the course of the past year, he and a few other Challenger owners have taken turns holding the overall record for the world’s quickest Hellcat-powered car. Cole currently sits second overall, trailing only the manually-shifted Epling Garage Challenger. In any case, after running into some engine troubles late last season, Michael Cole had the supercharged Hemi removed from his Dodge Challenger and rebuilt with some extra goodies. Yesterday, he headed to the track to see what his new setup would do without the aid of nitrous and we would say that it did pretty well – setting a new world record for a Hellcat car without nitrous oxide. Last year, Michael Cole ran a best quarter mile time of 8.79, setting the world record for a Hellcat Challenger with the 8-speed automatic transmission. That time was recorded with nitrous oxide and a handful of other modifications, including an excellent tune from Injected Engineering. During the off-season, Cole turned to Extreme Muscle Performance to rebuild and beef up his supercharged Hemi. EMP used a stock Hellcat block and crankshaft, but this Hemi has stronger rods and pistons and a custom EMP camshaft. The cylinder heads were lightly ported and the supercharger is a stock IHI unit, rebuilt by Jon Bond Performance and fitted with a smaller-than-stock pulley for added boost. Also new for 2018 is an ice tank setup installed by Swamp Yankee Performance. In addition to the engine upgrades, Michael Cole’s car has undergone significant weight reduction which appears to include fixed, lightweight composite windows and a bare-bones interior. This car has the 15-inch wheel conversion, allowing him to run those huge tires out back and the stock transmission has been tuned to get through the gears as efficiently as possible. With Michael Cole working with a new engine build, he was running the car with a blower-only setup, which only means that he wasn’t running nitrous oxide. This was likely done to go a little easier on the engine as it is broken in, but based on these blower-only numbers, we cannot wait to see what he runs with the bottle. Without the nitrous, Cole’s Hellcat Challenger ran a 9.135 at 150.1 miles per hour and he did so with a 1.343 60-foot time. I have a database of the quickest Hellcat cars in the world and in that spreadsheet, I keep track of the 60-foot times as well as 8th mile and quarter mile. On my list of over a hundred Hellcat cars, none of them have recorded a 60-foot time this low, so in addition to setting the world record for the quickest no-nitrous Hellcat quarter mile, it seems as though Cole’s Challenger might have the quickest 60-foot time recorded by a Hellcat-powered machine. On his previous record run of 8.79, Cole’s 60-foot time was a 1.363. It should go without saying that when Michael Cole turns on the nitrous, his Hellcat Challenger is easily going to run in the 8s, but how far? 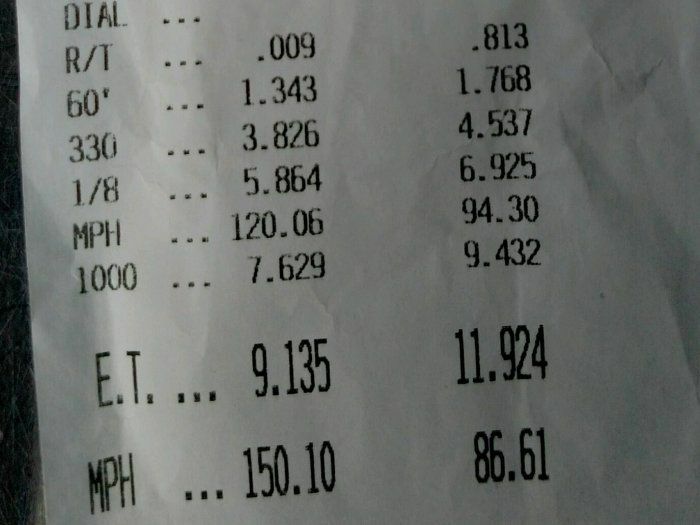 The current record is an 8.71 and with Cole running an 8.79 last year with the stock heads and camshaft, it definitely seems like an 8.60 should be within reach. Then again, I happen to know that the Epling Garage team has been hard at work on their Hellcat Challenger this winter as well, so as the weather warms up and more tracks around the country open for the season, we should see an awesome battle for the title of the world’s quickest Hellcat car. In the meantime, check out the video below of Michael Cole’s car flexing its muscles yesterday.